The SON (Schmidt's Original Nabendynamo) axle has two male spade connectors. In the photo below you can see one female wire connector attached to a male axle connector, and the other connector pair unattached. The SON SL hubs are different. Please see this page for details. Most versions of the SON28 and SON20 hub made between 2001 and 2011 must be aligned in the fork so that those connectors are on the right (chain) side of the bike. If you have an older SON28 hub with a black painted center section, SONXS, SONXS100, SON20R or SONdelux it makes no difference which way you align the hub in the fork. And with the new SON hubs from 2012, you again have the freedom to place the hub in either orientation, unless it's a disc hub. 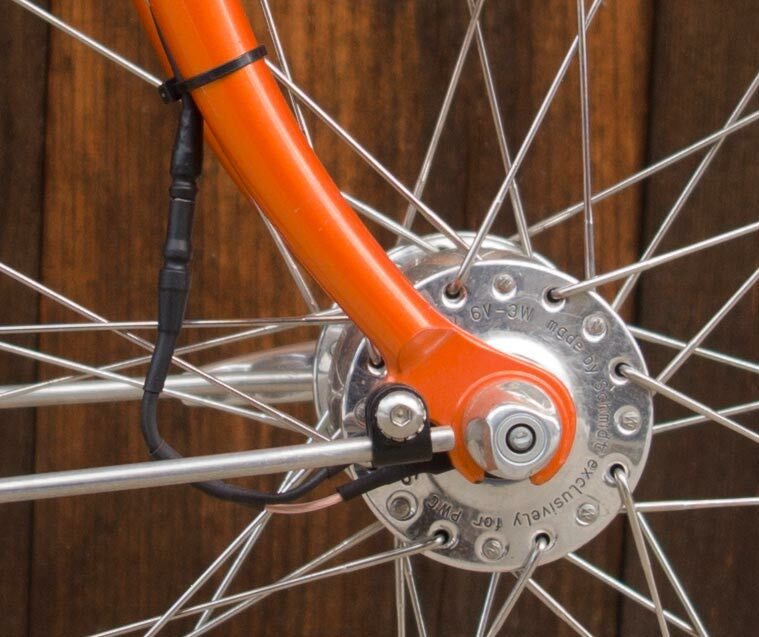 On bikes without disc brakes, the connectors can be on either side of the bike. The Schmidt Edelux II is available with 60cm wire or 140cm wire. The long wire versions can be cut to the length you want. Instructions are included for attaching the loose female connectors to the wire after cutting the wire to the appropriate length for your particular installation. Always leave yourself a few extra inches of wire that you roll up. You never know if the wire might be damaged and you might have to splice it back together. Having a bit extra never hurts. If you wish, we can cut any long wire version to the length you need and attach the connectors with our special crimping tool, which does a far better job than can be done with pliers. Let us know when you purchase your light. We also sell proper crimping tools. All Busch & Müller headlights have male 2.8mm connectors for attaching the wires to the taillight. Most headlights have these connectors embedded in the bottom of the headlight housing. The Busch & Müller taillight wires we sell come with female connectors at the headlight end and either bare wire at the taillight end or another set of female connectors. Their new CYO headlights have those male connectors at the end of a short section of wire, rather than embedded on the underside of the headlight housing. But the connections are the same. If you won't be using a wired taillight, cover those connectors with electrical tape or shrink tubing. And, be sure you don't use those leads to connect your headlight to its power source. If you do, the light will still come on, but you won't be able to switch it off, because those taillight wires are in effect 'downstream' of the switch. The long wires from the CYO headlights go to the hub dynamo, and are connected to the switch. The Lumotec Luxos, Avy and Lyt headlights come with a loose two strand wire with female connectors at one end. This is not for use as a taillight wire. It's for connecting the headlight to the hub dynamo. Look carefully at the bottom of these newer headlights and you'll see two pairs of male 2.8mm connectors. One set is for the taillight, and the other is for the dynamo. Connect the included wire to the dynamo (in) connectors. If you connect the hub directly to the taillight connectors, the switch in the headlight will no longer function, and your light will be on all the time it has power. For a single headlight installation, the wiring is quite simple. Even I can get it right! The two female spade connectors are slid onto the two male connectors on the SON axle. It makes no difference which wire connector goes on which axle connector, as the SON hub is not grounded to the frame. See the photo above. By the way, Shimano and Sanyo dynohubs do ground to the frame via the axle. So if you're not using a SON, remember that your hub is grounded to the fork, and remember that some headlights and taillights, depending on how they're mounted, may also ground automatically to the frame or fork. If you then connect a power connector to a ground connector, you create a short. Always connect power to power and ground to ground. Then, regardless of whether you're using a SON hub or a Shimano or Sanyo hub dynamo, you won't create a short. But don't be confused. There is absolutely no difference electrically between the two connectors on a Schmidt hub. The hub is AC and there's no ground as far as the Schmidt hub is concerned. The Schmidt axle is electrically isolated from the system. Want to charge your cell phone? As I write this section of the page in 2015, we are selling quite a few dynamo hubs to people who want to keep a cell phone or gps charged while on tour. They may or may not also want to use lights for night riding. It's easy to use your hub dynamo for either purpose. The lights and charger can be wired to the hub simultaneously. This is not a problem, provided you switch the lights off when charging your phone or gps, and, unplug the phone or gps from the charger when you are riding at night with the lights on. This is due to the fact that hub dynamos do not provide enough power to run your lights at full brightness while also charging your phone or gps device. As long as the lights are turned off, the fact that they are physically connected is irrelevant. But this also means that you must not use lights that cannot be switched off, such as the Supernova E3 Pure, or any headlight designed for use with a sidewall dynamo. The wires to the charger should have piggyback connectors attached. See the section below describing piggyback connectors. The headlight wires should have the standard female 4.8mm metric connectors attached. And then the headlight wires should be plugged onto the piggyback connectors, and the piggyback connectors plugged onto the 4.8mm male connectors on the Schmidt hub axle. This way, if you should decide to eliminate either the lights or the charger, you can still use the charger or lights. And or course, the taillight is still wired to the headlight, and the switch on the headlight controls the taillight, just as it would if there were no charger connected. With Sanyo/Panasonic or Shimano hub dynamos, you feed the bare ends of the wires to lights and charger into the proprietary plastic clips that come with those hubs. Just double up one conductor each from headlight wire and charger wire into the two openings on the plastic clips and you're all set. If you're buying either lights or charger from us for use with the Schmidt hubs, we'll gladly crimp the appropriate connectors onto the wires for you. The piggyback connector is on the left and a standard 4.8mm connector on the right. The wire would be crimped to the top, just like a regular connector. And the piggyback connector attaches to the SON hub the same way. But it also has an additional male tab. By the way; we sometimes get lazy and call the 4.8mm connector a 5mm connector. Don't be as confused as we are. They're the same thing. Here, the regular connector (on the left) is partially connected to the piggyback connector on the right. So, with two piggyback connectors on the wires from one CYO headlight, and regular connectors on the other, you can have two lights wired in parallel. 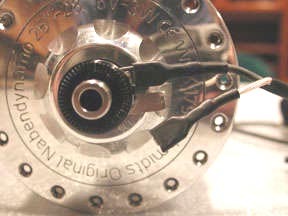 To do this when using a Shimano or Sanyo dynamo hub, you feed one lead from each headlight into one side of the plastic connector, and the remaining two leads into the other side. You can't do this with a voltage limited hub. But, since I don't sell any voltage limited hubs, there aren't likely to be too many of those on this side of the big pond. These piggyback connectors can also be used to integrate a Busch & Müller E-WERK into your system. One set of leads goes to the headlight, and the other to the E-WERK. We now sell two tools for crimping connectors onto wiring. This is the very best tool for crimping the wire connectors for both Schmidt hub terminals as well as the terminals on dynamo lights from Schmidt, Busch & Müller and Spanninga. Place the connector in the tool, insert the wire into the connector, and squeeze once to make a perfect crimp onto both the insulator and the conductor. Made in Germany. As with most of our lighting products, we offer this to bike shops at wholesale pricing. This multi purpose tool crimps the connectors. Not as sophisticated as the Knipex tool, as you must crimp the insulator and the conductor separately. But for the shop installing the occasional dynamo light system, it's ideal. It's also ideal for the home mechanic. Made in Germany. The tool also purports to be a wire stripper. However, it does a horrible job of stripping wire. So just use it for crimping the connectors. So, you bought a Schmidt Edelux headlight to mount at the fork crown, and the wire is 60cm long. But now, you want to mount the headlight on the handlebar, or perhaps on the front of a rack, and the 60cm wire is too short. Here's the solution. 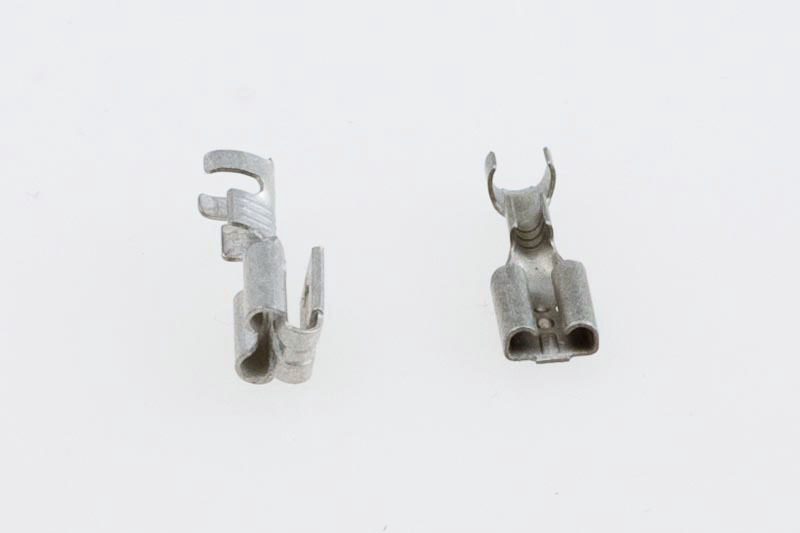 On the right is a female 4.8mm spade connector used to connect to the male connectors on the Schmidt SON hub axle. On the left is the same connector, but with a male stub that the nice folks at Schmidt soldered in place. For some reason, loose male connectors aren't available, so they made them for me. If you want your cable longer, let us know how much longer and we'll make you up an extension using the same high quality coaxial cable Schmidt uses for their headlights. Here's our assortment of connectors. Top left, the Supernova Gold Plated connectors. Here they are separated. Top right, the Supernova connectors are shown connected. Bottom left to right: Schmidt 2.8mm zinc plated connector for taillight connections. Next, the same style connector in copper as we get it from Busch & Müller. Next, the standard Schmidt 4.8mm hub connector. Next, the Schmidt Piggyback connector. Next (second from right) is the standard connector with male soldered plug, used for extending the wire from Schmidt SON hub dynamo to your headlight. And last, on the right is the Schmidt Ground connector, also known as a ring terminal. The most commonly used ring terminal has a 6mm diameter hole so it fits between a headlight mount and the Schmidt Edelux headlight. But we also now have these with 5mm and 3mm holes for other applications. If you have a custom frame with an SL type fork, you can use the 5mm ring terminals to carry ground from the fork to a headlight, using a 5mm eyelet brazed to the fork. The 3mm ring terminal is used with certain upside-down mounted Edelux II headlights to carry the power side of the taillight connection. The Supernova Gold Plated connectors are very useful. You can use them within the taillight wire if you have a bike with S&S couplers. Or if you find that you're frequently removing your front wheel, and are tired of unplugging the connectors before removing the wheel, and plugging them back on when you install the wheel, you can install the Supernova connectors down near the fork dropout along the hub to headlight wiring. They're easier to manipulate with cold fingers. 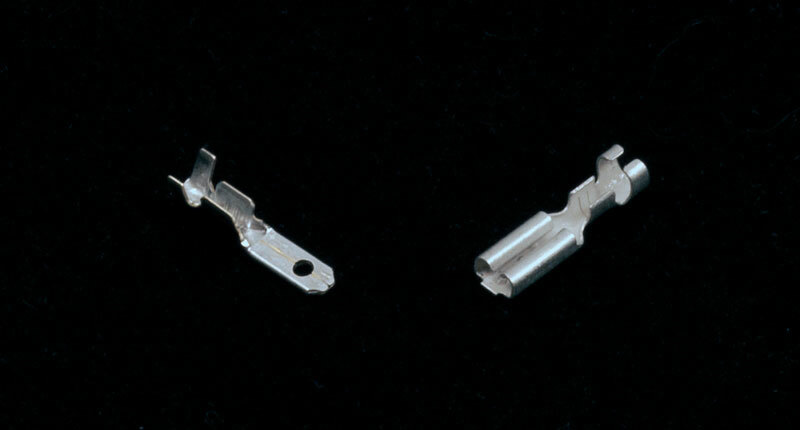 As of February, 2013, we also have 2.8mm male connectors. 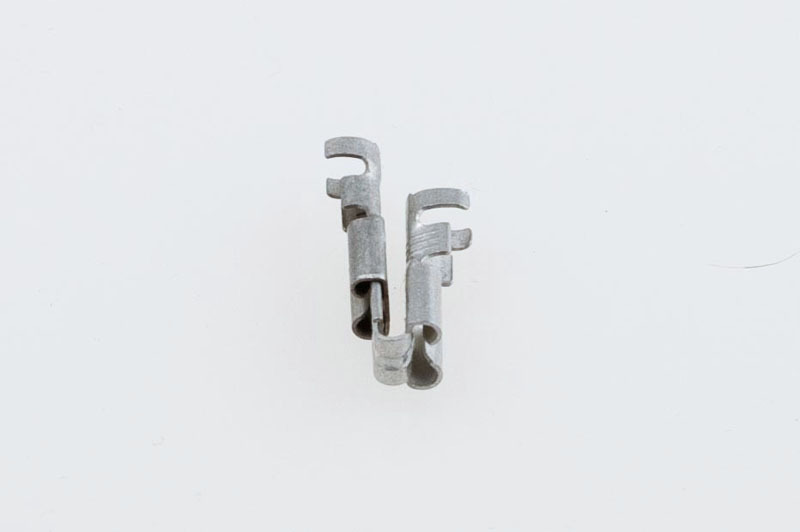 These are much less expensive than the male 4.8mm connectors shown above since they are stamped out in the bazillions by little green-eyed elves, deep in the Black Forest of Germany. The male connector is on the left, the female connector is on the right. We've had the female connectors for many years. But now, if all you want to do is lengthen an existing wire, you can do it. It's also a very inexpensive way to make a break in a taillight wire. This is handy if you frequently remove a rear rack for shipping a bike, or have a frame with S&S couplers. These male connectors have the same tab that Busch & Müller and Schmidt headlights have for the taillight connections. And, of course, if you would like to have us make up a wire with these connectors installed, just ask. Here, the wire is stripped, and ready for crimping. You can see the two sets of tabs on the connector. The left pair is to crimp the insulator. The right pair crimps the conductor. Here, the wire is laid into the connector. And here the connector has been crimped onto the wire. 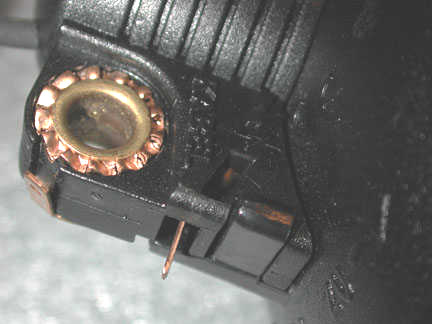 By having a separate crimp on the insulator, you take a great deal of stress off of the conductor, so the connector can be disconnected and reconnected to and from the hub axle many times without damage. When using the "Schmidt Basic Crimper" tool, first use the 0.5 - 1.0 position on the tool for crimping the conductor. Then use the 1.5 - 2.5 position for crimping the insulator. 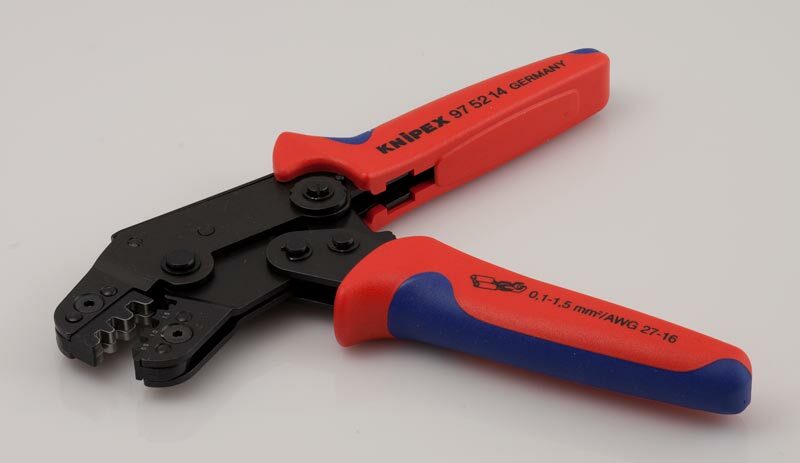 The more expensive Knipex tool makes both crimps simultaneously, and you use the middle position on the tool. After crimping the connector, you can and should then apply heat shrink tubing. Our heat shrink tubing comes in 1 foot lengths. The stated size is the size before it's shrunk. It can shink up to 1/3 it's original diameter. So it's referred to as 3:1 tubing. All of our shrink tubing is black. 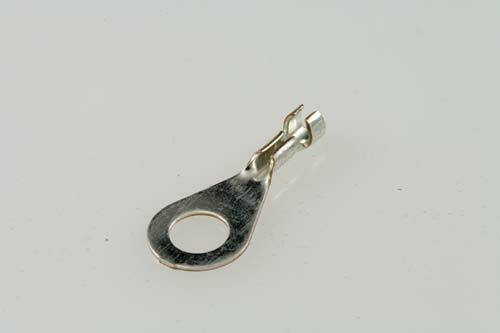 1/8" is used for the 2.8mm spade connectors commonly used for taillight connections. 3/16" is used for the 4.8mm spade connectors on most Schmidt SON hubs. 1/4" is used for the Schmidt Co-Axial Connectors. As of 2017, we have a more convenient method of connecting your headlight wire to the hub. The Co-Axial Connector. If the power source is a dynamo hub, rather than a sidewall dynamo, the taillight should be wired to the headlight, not to the dynamo hub. Only the headlight is wired to the hub. Busch & Müller, Schmidt and Spanninga headlights have small spade connectors on the bottom which are used to connect to a taillight. If you're using a sidewall dynamo, the dynamo is its own switch, so you would never have all of the dynamo's power going just to the taillight, sending it up in flames. Therefore you can wire that system any way you like; dynamo-headlight-taillight, taillight-dynamo-headlight, etc. Some of the newest taillights can handle all of the current from a hub dynamo. So this rule doesn't necessarily apply any longer. The connectors on most dynamo lights are marked for power and ground. If your hub grounds via its axle (like Shimano and Sanyo) and you're using certain headlights and taillights that ground via their attachment points, and the frame is steel or aluminum, you can often power the lights with a single wire from the hub to the headlight and then to the taillight. This is because the ground connection can be made through the frame. When the headlight is attached to a steel bracket and mounted to the fork crown, a ground connection is automatically made to the fork. But this is often not the case with recently designed headlights and taillights from Busch & Müller, mostly lights introduced since about 2006. There are some "gotchas" with this wiring method. Some headsets will not conduct electricity. The Shimano sealed cartridge bearing headsets for instance, will not conduct. So if you have one, you will need to run a wire from the headlight's ground connection to either the main frame, or run a second ground wire from the headlight to the taillight, along with the power wire. In that case, I like to wind the two leads together for a cleaner installation. We have double strand wire with connectors at one end available for this purpose. The nylon handlebar mounts also will not conduct electrical current. So if you use it and a taillight, you will need to run a second wire for ground. Since it's no more work to run a two conductor wire between the headlight and taillight, I recommend you dispense with trying to run just power between the two. Use a two conductor wire and eliminate the whole issue of conducting current through the frame and headset, fender, rear rack, etc. Well, almost eliminate it. If some components of the lighting system ground directly to the frame and if you run a two conductor wiring scheme it's easy to create a short circuit if you don't always connect power to power and ground to ground when you connect the wires. A short circuit won't damage anything. So, if you wire up the sytem and find it doesn't work due to a short, just correct the wiring and all will be well, no harm done. This is the ground connector (to the taillight) for the Schmidt E6 and Edelux headlights. 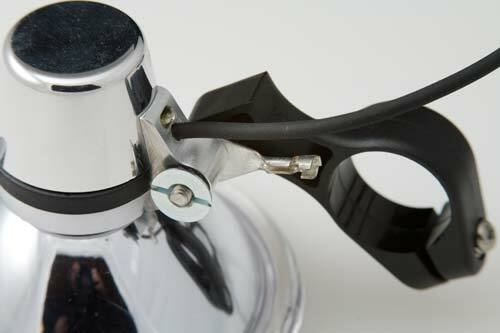 The flat part with the hole in it is placed against the aluminum base of the E6 or Edelux headlight and the bolt that holds the headlight onto whatever mount you use will also hold the ground connector. By having the connector pressed against the base the connector gets the ground current from the base. We can supply taillight wiring with this connector already attached. Here's the E6 headlight with the custom handlebar mount. You can see the ground connector between the base and the black mount. The right end of the connector has crimps that grab the wire and the wire's covering. You can use pliers to bend the crimps onto the wire, but we have a special crimping tool that really does a better job. You only use the ground connector if you are using a wired taillight in the system. The ground connector is not used to connect the Primary to the Secondary. That connection is entirely independant of the wiring to the taillight. Here is the same E6 headlight and it has a power lead attached for a taillight. If you go back up a bit and look at the photo just above you'll see an opening for the power connector. Now in this photo the connector is attached to the taillight wire. And the ground connector is there for the ground wire. Some of our taillights ship with a single strand wire. That's because traditionally the commuter bikes in Germany have been made with steel frames and with headsets that conduct electricity. So the ground connection has always been made from the fork where the headlight is normally mounted, through the headset and into the frame. Then it is passed through to the fender or rear rack to whichever is holding the taillight. So you have normally only had to run a single wire for power. But many frames no longer conduct electricity through the fork and frame. Some headsets like the Shimano Ultegra sealed versions don't conduct electricity. And many applications require a nylon mount. This means you'll need a second wire for making the ground connection. We have a double wire with connectors attached at one end if you need it. The image above shows a single strand version which we no longer sell. It's more expensive, but Wilfried Schmidt has made up some taillight wiring sets that are more durable than these double strand wires. They use the same heavy coaxial wire as used for their E6 and Edelux headlights, and have a proper ground and power connector for the headlight end, and either 2.8mm female spade connectors or bare ends for the taillight end. Finished with the 2.8mm taillight connectors, the price is $ 15.00 , with bare ends and loose connectors, the price is $ 14.00 . At the headlight end, you can get these two ways. One way works with any headlight that can ground through it's base, such as the older halogen Lumotecs, Schmidt E6, Edelux or Edelux II. One connector is placed at the base and attaches with the same bolt used to mount the light. See the "ground connector" pictured above. The other connector is the 2.8mm connector for power. But the newer Lumotec IQ Fly, CYO, Eyc, Luxos and Avy headlights don't ground through the base, and use two 2.8mm connectors, one for ground and one for power. So we also have wires made up with two 2.8mm connectors at the headlight end, and either two more connectors for the taillight already attached, or supplied loose for you to cut and fit yourself. If you need to watch your pennies, by all means use the double strand wire above. But for the most durable connection, and even a better looking job, use the Schmidt Coaxial taillight wires. I also stock Schmidt's coaxial wire by the foot. $ 1.00 per foot. All connectors are available individually. Here's my page showing how to properly strip this co-axial wire, attach the metric connectors and install the heat shrink tubing. For Busch & Müller's newest headlights, the Lumotec LYT, Avy and Luxos models, the wiring that connects to the hub dynamo plugs into 2.8mm connectors on the headlight. This means that if you would like a heavier duty wire, you can have it. We make up 55cm wires using the same co-axial wire that Schmidt uses. We attach the 2.8mm connectors at one end, and the 4.8mm connectors at the other end to attach to the SON hub's axle connectors. If you're using a Sanyo or Shimano dynamo hub, we have these with bare ends at the hub. Our Busch & Müller taillights have connectors which are clearly marked for power and ground. Attach the power connector on the taillight to the power connector on the headlight, and do the same with the ground connections if needed. Shimano dynohubs are different from Schmidt in that they do make a ground connection to the frame. That doesn't mean that the connection will make it past the headset to your taillight, though in most cases it will. If it does you will only need a single wire runing to the taillight if the headlight is also grounded to the frame. But you must be careful not to create a short. Many of the taillights that attach to a rear rack will ground to the rack via their mounting bolts. Though not all models do this. The Toplight Flat Plus does not, for example. If by accident you attach a power lead from the headlight to the ground connector on the rack and if the headlight, taillight or Shimano hub is grounded to the frame, you'll create a short. 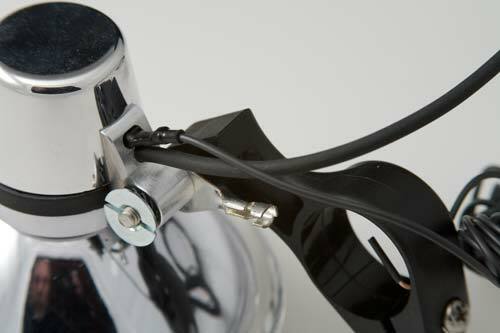 The power leads must only be connected to other power leads whether at the Shimano hub or the headlight or the taillight. Some folks think it would be great to run wires from the hub to the headlight, and another set of wires from the hub to the taillight. And they're right, it is great, but only if you have a Busch & Müller taillight designed from about 2012 on. Earlier taillights can't handle all of a hub dynamo's power. If you run the lights this way with a hub dynamo, and if you then switch the headlight off, all of the hub's power is available to the taillight, which is not designed to handle it. So, your lovely little taillight will go up in smoke. It's true that with a tire driven dynamo, such as the Dymotec 6, you can run wires however you like. You can run from the dynamo to the taillight to the headlight, the dynamo to the headlight to the taillight, or the headlight to dynamo to taillight. This will work because the dynamo itself is its own switch. But a hub dynamo is always "on" so to speak, so the taillight is only protected from overvoltage by wiring it directly to the headlight. Toplight Line Plus, Toplight Line Brake Tec, Toplight View Plus, Toplight View Brake Tec, Toplight Mini, Toplight Flat S Plus, Secula Plus. To see how to mount headlights and taillights, go to the mounting lights page.